Melon Fruitfly is the most damaging pest of cucurbits and considered as an important obstacle for economic production of Cucumber , Bottle gourd, Bitter gourd, Sweet gourd, Snake gourd, Ridge gourd, Pointed gourd , Sponge gourd, Pumpkins , Mask melon, Watermelon. Plastic Funnel with shade and polythene tube for collection of specimens. Fruit fly control in Vegetables specially for Tomato, various gourds & other cucurbits. To fulfill the requirements of our clients, we are engaged in offering extensive range of Tuta Traps. Our products are highly recommended amongst the clients for their reliability. We offer Tuta Traps to our patrons as per their needs. Moreover, our products are used for prevention and protection of crops in various places. 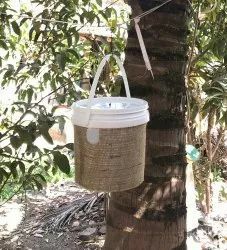 BIOJAL (Pheromone Trap) used for trapping of the moths of pests of various crops are made up of plastic material (resistant to sunlight, rain and wind), of bright mustard yellow colour (most attractive colour for the moths), which could outlive a period of one year. Uses: Control of all major fruit flies effecting Mango, Goava,Orange,Annona,Sapota,papaya,Olive,Melon,etc. 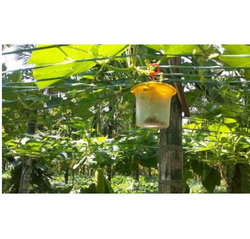 Insect Type: Control of all major fruit flies effecting Mango, Goava,Orange,Annona,Sapota,papaya,Olive,Melon,etc.